Glory be, glory be, it's done. Finished. Done and dusted. Over. Practically. Almost. The edits are all done. I have the weekend to go over KOTW one more time and then we send it to the copyeditor. The copyeditor basically makes sure I haven't made any huge mistakes, and corrects all the little ones before it's too late. She'll tweak and suggest and cut and replace, and then she'll send the manuscript back to me and I'll make my final adjustments, and that'll be it. Boom. Over. Right now, the book clocks in at 134,729 words. Considering that Death Bringer was marginally over 118,000 words, that's quite a substantial increase. Golly gee, it's gonna be a big book! We're going to have to reduce the font size again to cram as many words onto the page as possible, but our font size is typically big anyway, so at least we have room to play with. It's a weird thing, to write a series, because the readers get older as the books are released. Valkyrie gets older, the situations she finds herself in become more grown-up, and the themes get darker and darker as the end approaches. What all this means is that occasionally I fall into the trap of assuming that the Skulduggery readership is able to handle whatever I throw at them. And for the most part, they are. But there will ALWAYS be new readers. There will ALWAYS be a nine year old who picks up the books for the first time and reads them in a few weeks. And it's unfair to expect that nine year old to be able to deal with content that is more suited to teenagers and adults. So where does that leave me? In a weird place, that's where. On one hand, I've NEVER viewed this series as strictly children's books, and that view just keeps getting stronger and stronger as Valkyrie gets older. But on the other hand, I have a responsibility to the younger readers to not give them anything they can't handle. And all of this makes me ever-so-thankful that we have such a thing as editors. I wrote this book in two and a half months of sheer WORK. There was no time to doubt myself and no time for second guesses. Whatever I put down on the page stayed on the page. When you have a more relaxed timetable you can afford to wonder about what you've just written but when the deadline is rushing towards you like a screaming train you just WRITE. With that in mind, I'm not surprised at all that I went too far in some areas. And it was so much FUN. The battle still isn't over, by the way. Nick, my editor, still thinks I could be a little less bloodthirsty, while I think I'm just bloodthirsty enough. Some serious things happen in this book, and I reckon I needed to be as brutal and uncompromising as possible in order to achieve what I needed to achieve. But we have another week or so of him trying to be serious and me making jokes before I have to make the final decision. I`ve always wondered about the ratings, you know? 9+ for a book like Death Bringer? Good lord! Considering all the creative ways you kill people in this series, it`s a miracle no one thought to mention this issue before ... at least not out in the open. Anyways, I love your books. I think you`re just like Gordon Edgley in that regard: You create a character who is high up on his mighty horse and then you spend the rest of the story dressing him down until he`s all humble --- and then you make him die. And I bet you think it`s funny, too! And I completely forgot to mention that I would totally LOVE to have Nick`s job. Who wouldn`t?! Can't wait for KOTW! Haven't even got death bringer yet though....or playing with fire.....or dark days...ah well....eventually, i'll have the money..eventually. Anyway, really can't wait for KOTW, better get Death Dringer first. Yes number 5! no, blood thirst is good, it makes fanfic dramas better, and deviations better for deviant art. Derek, keep it. again, my name isn't Paula, mother took over my account... *sigh. i'm gonna die if i don't read it! if Sanguine dies i swear i will not let Valduggery take over! go Ganith! And I bet it is way better than anything I write! Haha. In the final trilogy, can Finbar get an illegally imported dragon egg? Wait..Blog, duh. FOUND IT. SORRY, I AM AN IDIOT, SOMETIMES. Comes with being blonde, though. X3 haha. I Lent All Of Mine To My Friend, Then Wouldn't Touch Them For A Week Because They Smelt Like Her House. So They Were Quarantined In My Nana's House For A While. And Yes My Nana Read Them! I Am One Proud Girl! Yaaay! 1st page! 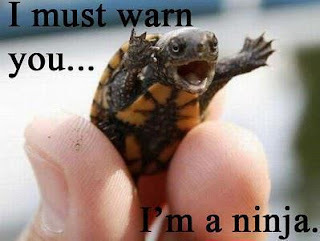 very cute turtle, by the way. I am reading your story, it's pretty good, y'know? A few errors here and there, but they're to be expected. The plotline..It's ever so slightly confusing, at least it would be for some people. I had to read parts of it multiple times to completely understand what was going on, but it's really good, you should keep at it! Hi Derek! Can you visit Norway some time? I try to get my little sister to read your book, she is 10 years old, but she would rather me read it. She is still on book number one and she doesn't want me to read the rest. She said it was because of that creapy man that broke into Stephanie's house, you know, the night when her mums car broke down? So I'm gonna wait until she is 15 to let her read it so she won't get scared. I'm trying to get my brother and father to read it to, but they're so lazy. Anyway, can't wait for KOTW to be done. It's gonna be awesome!!! Who here has a Kindle? I wonder what Mr Landy thinks about kindles? I can't stand Kindles. Just as I can't stand people buying books online. Book shops will become redundant, at this rate. It ruins the thrill of going into a book shop and trying to find the book and then that moment of excitement when you find it, especially when it's the last one! And turning the page...I LOVE turning the page...I don't know what it is about them, I just adore turning pages in books...The secrets they hold and ASDFGHJKL. Just beautiful, I don't want technology to take away the magic of books...I shall never get a Kindle. Are there any dates yet for the book tour in Australia? I need to book flights to Sydney because I doubt he's coming to Perth. Book stores are reasonably priced, but kindles are MEGA cheap. But I do like books too, and I have quite a collection of them, which now all look VERY well thumbed. Also is Mr Landy coming on tour to England? If he is I will be OVER THE MOON!!! The handset is quite xpensive, but the books are very sheep if they've been out a while. New ones are the same price and the hard back, I think. Each to their own. I'm not anti-books, I mega love books, just if you read ALOT, kindles are cost- effective. I think you should ignore your editor. It's just a book, and I'm sure the nine-year-olds will handle it. I like violence! The humour will make up for the blood-thirsty. You do make me laugh Mr Landy! I agree with Xanna. 9 year olds can deal with a lot. Hi everyone whos on! *hands everyone cookies* How r you all? yup. For my german essay, we had to write what we do in our free time. I JUST PUT READING. I don't even watch tv! LOOOOOOOL. I write way too much, sometimes...I tend to write, just to read. Even though I am a terrible writer, haha. I bet ur not a terrible writer! What typa stuff dya write? What genre? STAR. ROBIN. FLAME. SPARKY. LYNXIA. EVE. MIST. ALL THE PEOPLE I USUALLY TALK TO ARE MISSING. :O NOOOOOOOO. I've missed themmmmmmmm. im good nights raven. u? Ill look at some of ur writing after dinner, luciana. dya have the url for ur blog? how do find it? srry, i dont hav a blog, so i dont no these things. kl l. Ive been w8ing for him 2 blog all week, 2. But i dont have much time to comment on skol nights, too much revising! stupid summer xams. Also, I love online bookshops. And Kindles. Those of you who think they shouldn't exist might spare a thought to those of us in countries where we cannot get the books from physical bookshops - and believe me, having to travel all the way across Europe to, say, the UK in order to buy the books there might be just a bit cost-prohibitive. Plus, you know, we'd never even be able to discover all those books in the first place. *hands luce a cookie* im happy he posted too. And Kribu, I am merely saying I believe that in the UK online shops are going to end up running bookshops on the high street out of business, the economy isn't very good as it is...Just my opinion. hi kribu. =-). L, ur story is rlly good! Don't get mad at me if i'm wrong, but is it Fletcher and Valkyrie? Hey, Snoogy! *waves* I like to wave. *waves again, for no apparent reason*. Hi all, how are we today? Willow, it's nice to finally talk to you! I've heard of you, just never talked to you (not that I remember, anyway). Hello. I'm meh, in the middle. How are you, dear? Bloodthirsty, violence, deadlines, and younger readers, huh? Well, personally, I love the bloodthirst and the violence, ultimately because you manage to write it so well, Derek. However, 9-year-olds may not, right? Well, your editor was trying to make the conversation serious, but your jokes kept the level of seriousness at a minimum, right? So, if you have the humour and the jokes in to balance out the violence and the bloodthirst, it may be a little easier for the younger readers to read. Or, so says the logic of my brain. Hi Luciana, I am quite good because I finished another chapter of my SP FF. Valkyrie, is ur bday in august too! r u the youngest in the year, like me? yay!!! go august bdays! OMG YOUR DONE!!!!! WOOOHOOOO!!!! *runs around throwing confetty into the air* EPICA!!!!!! Wish it would come out on my birthday unfortunatley i don't think you can get the book out in two days :P wish you could though that would make it an AWESOME birthday!!!!! happy birthday for 2 days! hi white willow. ur profile pic is anime. dya like anime? I think its awesome! DEREK! Don't wait so long between blog posts!! But yeah, seriously, POST MORE OFTEN! How on earth are your biggest fans supposed to blabber and mumble and ramble if the blog post only allows 5,000 comments, and YOU don't post for, like, TWO WEEKS?!? Yes, abrupt, I'm like that. Ninja turtle, huh? I get it... yeah... no, really... some of the slowest, clumsy animals I can think of being fast and... ninja-y [This is why I'm not a... thesaurus writer...] Makes perfect sense, doesn't it? You should post more often. So I left a comment on Veronica Roth's blog... It was awkward... I'm not as comfortable with her as I am with YOU. He gets along with everybody... He would definitely be Abnegation. I still have a cough. And I'm worried about various things. i close the comments bit, then refresh the blog page, then go back into comments. Hi Skyril, nice to see you (again). u can just call me 4060 or Stella. i cant get another name as i dont have a blog. And I figured out a better way to refresh without a refresh button! thanx skyril! kl valkyrie. and u, too can just call me 4060 or Stella. hey skyril, is ur pic anime 2? Oh, actually, no, Stella. A long time ago when I first came to this blog a few years ago, I would hang out at this website called gaiaonline. There, I had an avatar, and someone drew her for me. She looks quite similar to what my OC looks like today, actually. Most of us are quite insane, anyway. ah kl skyril. and, l, we can deffo talk! Greetings, Luciana! Pleasure to make your acquaintance as well! hi skulbug! amd i think that if the violence is necessary, then gr8. if 9 year olds dont like it, they dont have to read it. (tho they should give it a try. it is AWESOME!! I think he should do things for the old, first coming fans rather than do things for a "new audience"! mayb, but new people can like it 2, just if they dont like the violence, they dont hav 2 read it. hi dogs like bones! i never noticed an age rating.. will look now. Who, me? Well, if it is me you're asking, I play guitar, piano and I absolutely LOvE acting! Oh, and of course I love SP! I don't think people realise that it's not a book series, but a lifestyle choice! Yeah..., I don't think Derek Landy should necessarily change the way he write, but... I don't know, I guess I see both sides. I definitely lean towards what Derek Landy thinks there ought to be in it, though, because he IS the writer. This is all HIS stuff, you know? im 4060 or stella, bones. i dont have a blog, so im stuck with it. Luciana, how did you hear of me? I like to be un noticed in life so will you tell me how? I've never heard anyone voice my opinions better than other minions! I love Blogland! i agree with u skyril. hi banana! Wow, that's awesome! I've always wanted to take piano lessons, and I admire people who can play guitar. Hullo! Nice to meet you! I've been acting since I was five, and in September, I'm starting an extra acting class :/ Oh, and where are you all from? I think that deserves some creepy X-Files music! Doo doo deeeee dooooo! And I was here for Katrina, and now Katrina is in history books... weeeeeiiiird. I'm from Ireland. I was in Dublin an was walking past Temple Bar, and the first thing I thought was "I want to go visit Finbar!" Oh, btw I'm 12, almost 13! Meh. It's all I've got, really. Im not actually dancing, i would be if i had something to dance about, but i dont. I do, though, have something to be happy about. Flame, I am mostly okay, considered sucide, I miss talking to Rose but thats not the reason. Sorry, some friends i havent seen in ages. Anywho, you know, Sky, we all hang out on posts futher back..
lol, that's awesome. Shame Finbar probably wasn't there. Suicide bad, BAD i tell you. I had no idea you all did that. But i got the outline of my book i did in sixth today... AND im so happy, cos, i lke forgot all the things in it and stufff. BUT THAT DOESN'T MEAN YOU GET TO POST LESS! MAY THE 4th BE WITH YOU! Yay! Someone else knows it's Star Wars Day! I need to ask youi something. Y'know the way you're finished KOTW. well could you maybe go back and mention me just as a small tinyweenie cameo? I'd be so gracious and, infact, I'd bow down to you, and create a shrine and worship you. (already done it) no treally.. But, could you maybe? AND THIS IS ME ANNOYING DEREK TO ADD me INTO KOTW NO ONE ELSE! Ha! I once dressed up as Princess Leia for a party! My hair was awesome! Did he? What chapter? What part? What PAGE?? Oh, uh im not sure o.o Have you read it yet? And rosella. but i was talking to them and they said they nagged him for months, but thats why im now going to nag him. AND DEREK CAN THE SUBLINE FOR BOOK NINE BE: Pleasant Dreams?? Ooh! That's good! I'll beg with you! Derek! Choose that subline! I love it! But now, sadly, I have to leave. And, seeing as I'm in the top 200 comments, Derek, will you say happy birthday to me (in the blog) on June 15?